31 years ago today at around 7:13pm I came out of the church bathroom, nervous as a long tailed cat in a room full of rocking chairs and said, "I do". It was my 2nd marriage, the first ended when I decided that a life of being a punching bag was just not gonna work. Unlike my first marriage, that was full of everything proper and expensive (LOL) ol Vern and I decided to just have fun and share the event with a small bunch of friends and family...no big fancy wedding, no big fancy meal, dresses or limo. Instead we got married in church, then did the customary in our area ride around town honking horns and acting goofy...So after the wedding we rode the "loop" like we did as kids and then headed out to his parents farm, where a pig was roasted. Mother n law was catering wedding cakes at the time and had a very pretty tall wedding cake set up on the table for us. We left later that night on the back of his 750 honda in a cloud of dust and rice. now for the "rest of the story" as Paul Harvey use to say. It was the day of the wedding and still no dress, no flowers ect...his sister, who had allready married my brother, went with me shopping. She got a fall colored dress and I got a cream colored street length dress and matching shoes..we made a quick stop at the local flower shop for some silk flowers that we just grabed and taped up together. .. like I said, nothing fancy. ol Vern on the other hand who was intending to wear jeans had his mind changed..LOL by his mom...she made him go buy a suit much to his dismay. Vern's best man, in a rush to get to the church, had slamed his thumb in his truck door, so there he stood with a big ol ugly hanky wrapped around his thumb to stop the bleeding. LOL...we did not look like your typical wedding party. I had only dated Vern 3 weeks when he popped the question...old fashioned, down on one knee in the back yard of the old farm he grew up on...my first responce to him?... "are you kidding me? "...and then said, "well.....um....yes!" That was 31 yrs ago...he has raised Dennis like his very own...from day one. We went on to have two more sons, CV and Joshua...we lost Joshua to Spinal Bifida at 15 months in 1985....Now we have a grandson...we've lived in 6 homes and ol Vern has showed me an Ocean and the Rocky Mountains and state after state from the back of his Harley. He's been there through the cancer, the pain, the hurt and the tears. We've been poor and we've been rich..
but most of all we've been together, no matter what life has thrown at us ever sense 7:13pm Sept 2nd 1978.
and......we'd do it all over again. Congratulations on 31 years Hollie & Vern! I wish you both many more! our marriage very similiar to yours.she took almost 10 years before she said anything about what happened in her first marriage.i adopted her son and this year he went to L (roman number for 50). tues.sept. 2 was number 48.and she is still pretty. Hi Hollie. I just re-read your post and took note what you said at the bottom. "We've been poor and we've been rich" From your own words you two have never been poor, you will always be rich as long as you have each other. God bless. Your Aussie friend, Wylie. You look pretty young in that one! but 31 years is quite a milestone, CONGRATS! Good going yawl! Hope you have many more and all of them better than the one before! Congratulations!!! Glad you both found a good one. No one, male or female should have to put up with being hit by their spouse. I got lucky too. My wife and I will soon celebrate 30 years, and I don't know how I could be happier. She had been married before and had 3 little kids when I met her, and lots of people said our relationship would never last. We proved them wrong. Both of us have changed a bunch, but we have changed in such a way that we have become closer together. We had 2 more kids together, and while I had stepchildren in the beginning, now we just have 5 children. They are all mine, as I have helped raise them. All 5 are doing well, all have college degrees that they mostly paid for themselves, and all are working at jobs they like. I think my wife was worried about how things would be after we retired, but it is just great. We usually do our own things during the day and then enjoy spending the evenings together. We have a great time with our 7 grandchildren, who we see a lot. It hasn't all been roses. For the first part of our marriage, we were pretty poor and were really crowded in our old single wide mobile home with an addition I built. Things go a lot better when our little kids all got into school and my wife found a good job. We dug ourselves out of the debt hole we had fallen into and later built a nice, new house, unfortunately not before the oldest kids had grown up. Our oldest daughter gave us, and especially me some trouble in her teen years. I had grown up in a family where you just didn't sass Dad, and you did what you were told, and I had trouble understanding that Patti didn't seem to understand those concepts. We got through it, but looking back, I wish I had been less hard on her. It would have been better and easier for both of us. We have a good relationship now, and I believe Patti is a wonderful mother. It is interesting to hear my words coming out of Patti's mouth when she talks to her kids. I thank God for giving me my family...it is a good life! All the best to you and Vern. And thank you for posting your thoughts. It was nice! Reckon you kids got it right!! Cogratulations you two. 31 years of wedded bliss and many more to come. 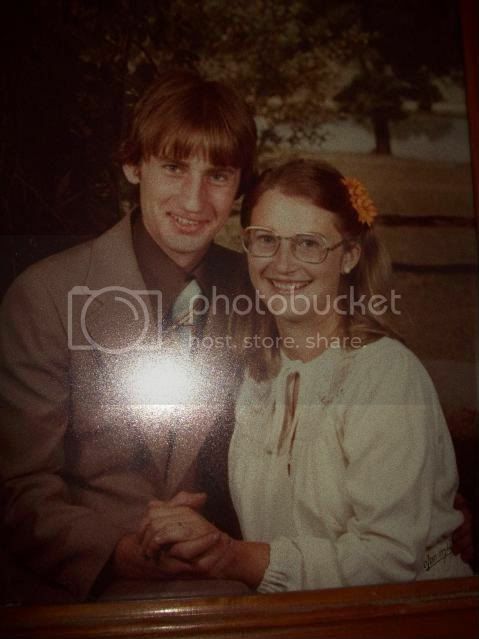 Congraulations Hollie, hope you two have another 31 good years together. Always enjoy your posts so much and thanks for sharing so much of your life and activties with us. And a huge THANKS for all you do for our fallen service men and women. Who's them young kids? the Holly and Vern I know are real old folks! lol Congrats you two. And Vern, you deserve a medal! Heres to you guys having many many more anniversaries. Congratulations to a warm, loving, giving couple. Nothing but the best you all. Congratulations for your Anniversary and for being the two special people you both are. It is a joy to read your post and to feel the happiness you've shared with us. Have a great day and both of you take care. Happy Anniversary to you an ol Vern Hollie! You both look the same...must be that clean livin'! xoxoxo Tracy. Congratulations! Sounds like you did good! Congratulations Hollie and Ol Vern. Being married for 31 years to your best friend and the love of your life gives nothing but richness. I am happy for you both and wish you nothing but the best for today and always. Happy Anniversary!!! Almost to late to get in here with my love to both of you. Anyone got a piture of the wheel barrow at the gathering???? Sure wish we could do it again. I know you will have many more years of good fun and love. Happy anniversary Hollie & Vern! Gran, did you mean this pic? Looky the side of Mrs H's wheel-barrer. It says True-Temper! Ole Vern seems to have sticky-to-it-tiv-ness to handle you all these years. Congrats TWO the both of you. You look like you have upper body strength and could've thrown a few punches in your day also. congratulations to you two! Hope you see many more of them. but, ya ain't ketchin up to us! We got married in 1950! Which reminds me-I'd better get that anniversary card for Ruth, or I'll be in the dog house! I forgot it once--there was a great icy period for a week, but, well, she got over it! It couldn't happen to a nicer couple.